So it happened again, in only a 1 1/2 year period since the Anniston Eastern Bypass fully opened in December 2015 and US 431 was placed onto the road. Another 18 wheeler did not stop and ran through a red light, the truck struck several cars and ended up in the nearby woods. Sadly, one person died at this wreck. This has not been the only wreck at this intersection of the Anniston Eastern Bypass at Coleman Road and Choccolocco Road. There have been multiple wrecks usually involving an 18-wheeler who does or can not stop, runs through the red light, and strikes other cars. This has been an HUGE problem since the bypass fully opened. And my question is this? 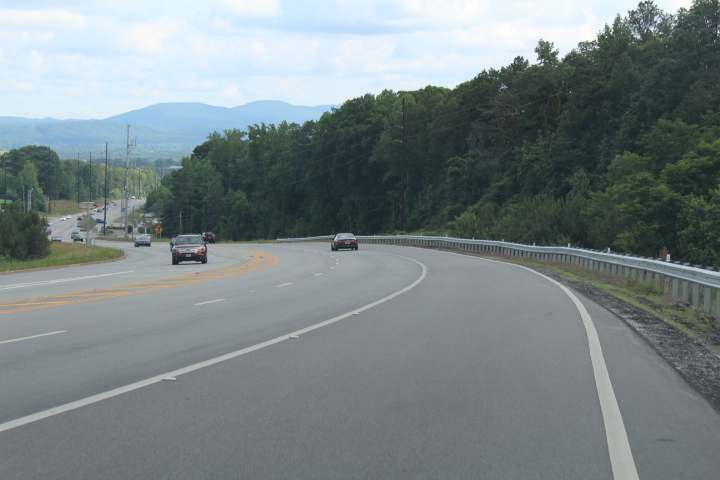 Why did ALDOT think a road like this where fully loaded 18-wheelers going down a large mountain hill and might have to stop at the bottom was a brilliant idea? Seriously! 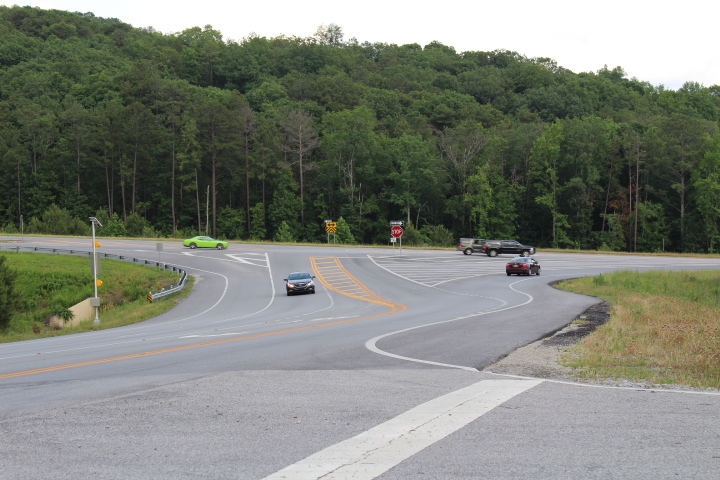 If we were in another state like Georgia, the intersection at the bottom of the hill would have been a freeway interchange so traffic on the US 431 bypass would not have to stop. This would eliminate the possibility that an 18-wheeler could not stop because it lost its brakes. But we are stuck with this and it’s hurting and killing people. Sure, ALDOT thought adding more traffic lights and adding 2 red lights at the top with yellow reflective tape for traffic going down the mountain was going to help? It’s not! But the troubles don’t stop there. There is also an intersection in the middle of going down the mountain called Henry Road. Right off Henry Road there is The Donoho School. And every morning and afternoon while school is in session, you see long lines of cars wanting to turn left onto Henry Road off the bypass, while cars are coming at them doing 65 mph +! On both sides, ALDOT did put up yellow flashers warning drivers of the intersection, but it’s clearly not enough! Some drivers who want to turn left onto the bypass from Henry Road have a really fun time doing so. Like this truck who stopped in the middle of the lanes going downhill to yield, not smart. And you can say, could drivers take a nearby parallel street and connect to Henry Road? Well, in a crazy move there is a no left turn sign to turn left onto Henry Road. Why is this here? Some have said putting a traffic light here would solve the problems, but sadly it will not. You see, if a fully loaded truck going down the mountain goes past the runaway truck ramp and sees a red light, and loses it brakes, well you know what will happen next. Having a traffic light here is NOT going to work! The only solution is to make the Henry Road intersection a freeway interchange, but ALDOT is cheap as we all know too well. So enjoy the long lines and long waits to get onto and off the bypass. 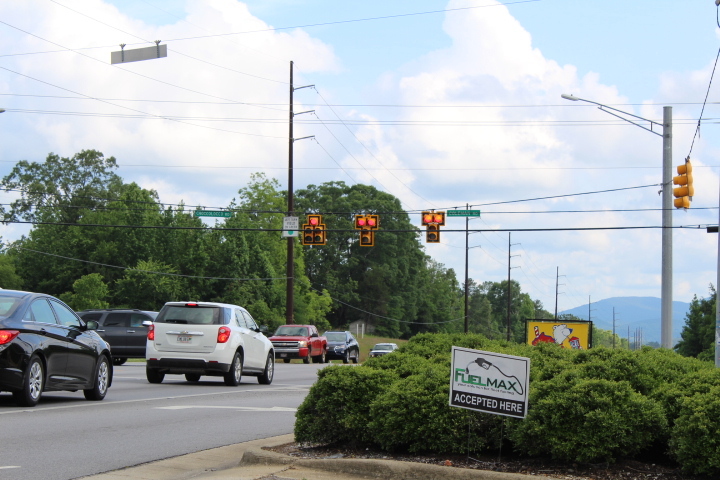 Now let’s focus on that Coleman Road / Choccolocco Road intersection. ALDOT did add more lights, but it’s not working. Going down the mountain, there is only a traffic light sign with signal ahead road markings. So, why there can not be a sign with flashers telling drivers and truckers that the light at the bottom of the hill is going to turn or be red? They do this on US 431 in Huntsville, why not here too? Another thing I see is ALDOT could make the yellow light longer and the all red, where all four sides are red, longer. If all four sides were all red for a longer amount of time, it might prevent some of these wrecks! ALDOT could also install technology that is used on US 280 in Shelby County that detects trucks coming down the hills there. Why is this not used here? But, nothing much can change until we deal with the biggest problem, everyone going WAY too fast going down the mountain. 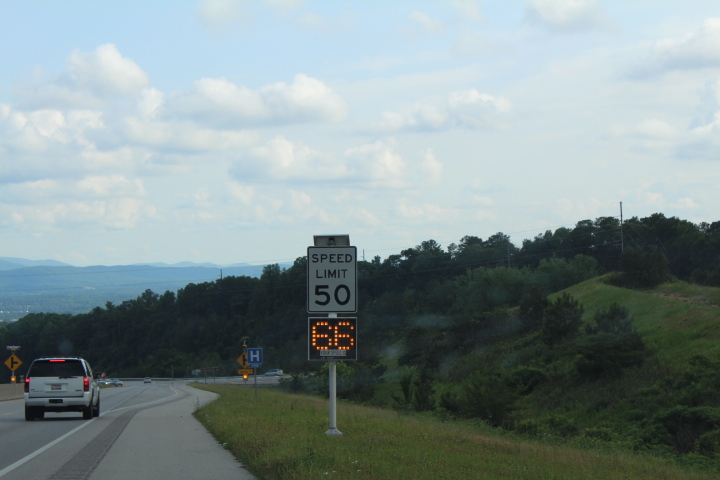 The speed limit drops from 65 mph to 50 mph while going down the mountain. Yes, while going down the mountain. Why is this not done at the very top? Yes, there is a radar sign that tells the speed drivers are going. And as you can see in this short video clip, EVERY driver is going way over the speed limit. So, why is there not a speed radar sign over each lane on an overhead pole? Or better yet, flashers to tell drivers you are going too fast? They do this on some roads in Alabama, it’s needed here too! And why is there not a LOWER speed limit for trucks going down the mountain? 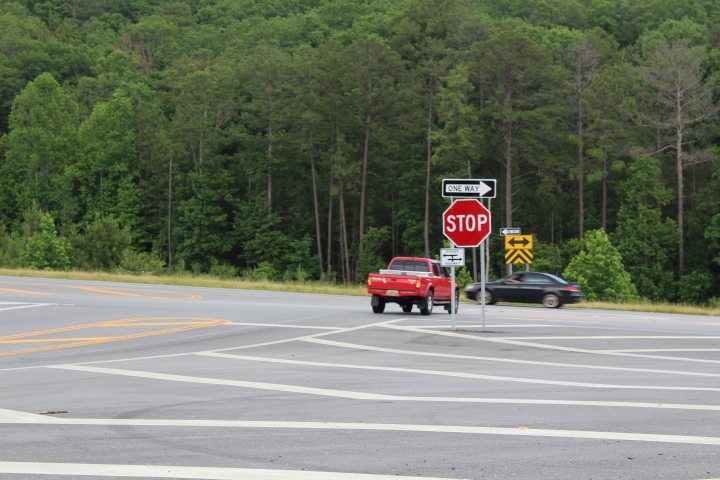 On US 431 in Guntersville, there is a lower speed limit for trucks going down Sand Mountain. The same for trucks going down Monteagle Mountain on Interstate 24 in Tennessee. 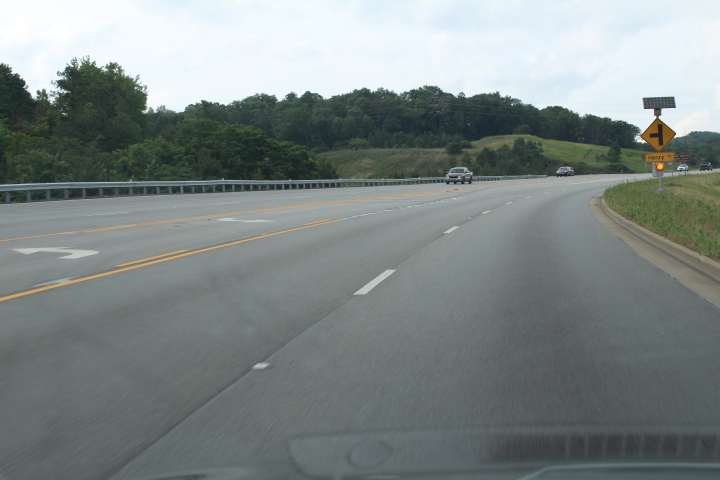 This stretch of road has the same downhill grade as the US 431 mountain. There must be a LOWER speed limit for trucks and 18-wheelers going down this mountain, I can’t believe ALDOT did not do this before the road fully opened! It takes a MUCH longer time for a 18-wheeler to stop versus a car. It takes a fully loaded 18-wheeler even longer to fully stop, someone was not thinking when designing this road about trucks going down the mountain who might not be able to stop because their brakes were lost? 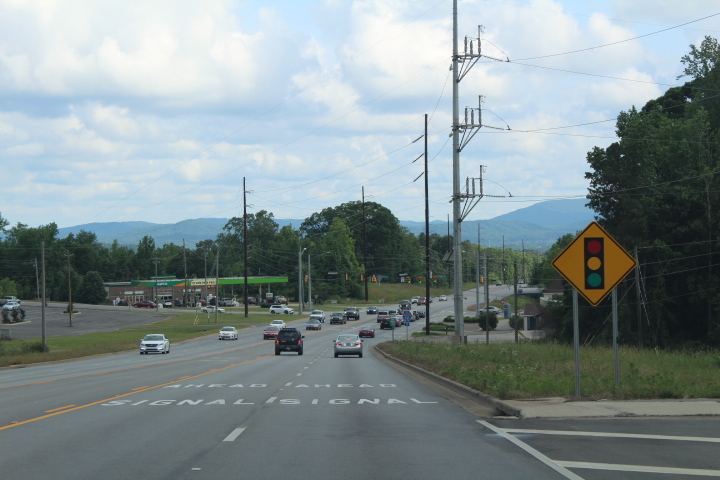 To sum things up, ALDOT needs to install better signage and paint markings, flashers with technology to tell drivers when the traffic light will turn red, and lower speed limits for trucks going down the mountain. The reason why many of us roadgeeks do not like ALDOT is because they tend to not listen to us for smart ideas or sometimes just completely ignore us. Another reason is because ALDOT comes up with some really dumb road designs and does not maintain or force towns to maintain their traffic lights for example when a sensor is malfunctioning. I guess ALDOT really does not care about this stretch of US 431, which is quickly becoming the most dangerous stretch of highway in all of Alabama. So, how many more people will be killed or injured before something is done here? That is the motto so many of us uses when we talk about ALDOT. Great ideas that should have been thought of in the design, but sadly, as you say ALDOT is extremely cheap in their vision and design. How about an overpass at that intersection, similar to the one they finally built over Highway 78 and the railroad tracks? Thank you for your thoughtful….and life saving ideas. I really wish something can be done soon. Our lives depend on it! That is a very dangerous intersection at coleman rd and henry road and on up hill where 10th street is. Come on folks please do something. Our lives depend on it! Yep, a car or truck speeding down the mountain and can’t slow down for a turning school bus with kids on it would be a HUGE problem. Hopefully something is done, thanks for commenting! Agreed, ALDOT is very cheap in their design ideas, I agree with you about an overpass and interchange idea, thanks for commenting! How stupid! 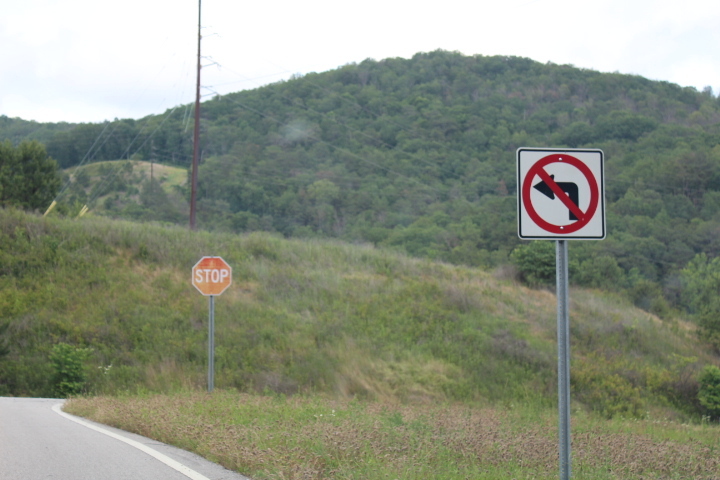 So one neighbor wants kids and families to risk cars flying down a large mountain instead of taking a safer shortcut? Wow! That is incredibly sad, thanks for that comment! The stupid thing you’re talking about is all the school kids not paying attention to speed limits on a narrow, winding residential road, twice a day. I sincerely doubt you would appreciate dealing with it every morning if it were your street. Not to mention how dangerous it was for children. So thanks for your insight. Well, there can be speed bumps or speed humps placed to slow traffic down then. People are going to take the path of least resistance to get where they are going. Thanks for the comment. I think cameras should be installed to get tag numbers and if the speed limit is not adhered to, an automatic ticket with a high price could be mailed. A quick revenue stream would be made then to pay for the technology. I’ve seen this used in other states. They need to make the truck drivers go back to taking the old route 21 through Anniston. Until they resolve the problem. Put a sign that says “All 18 wheelers must turn right” at the light where you turn right to go to hwy 21. Good thought, but will never fly here in Alabama since so many including politicians are opposed to red light and speed cameras. Thanks for the comment. 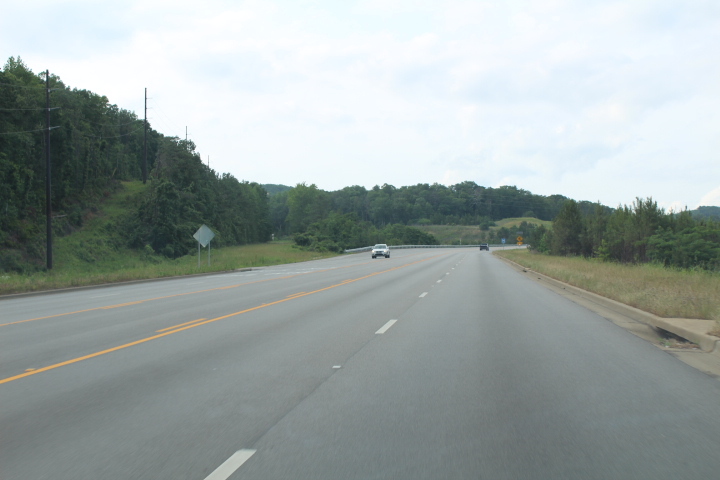 The bypass was made for trucks and cars to bypass Anniston and serve the McClellan area which has hardly been developed. Maybe they might have to do this temporary. Thanks for the comment. I’m sorry for your loss. I hope something is done so more people do not lose their lives over some horrible roadway design. Thanks for coming on Geek Alabama and leaving an comment. I am so very sorry for the families of those who have been killed in these accidents. I have 2 daughters and 4 grandchildren that live in very close proximity to these intersections. Our grandchildren attend Faith Christian School which is also very near. I pray that God will give wisdom and direction to those making decisions that concern so many. I have a couple of suggestions. Ban trucks from this section. Send them back down Quintard. You say that speed is a problem. Where are the police? 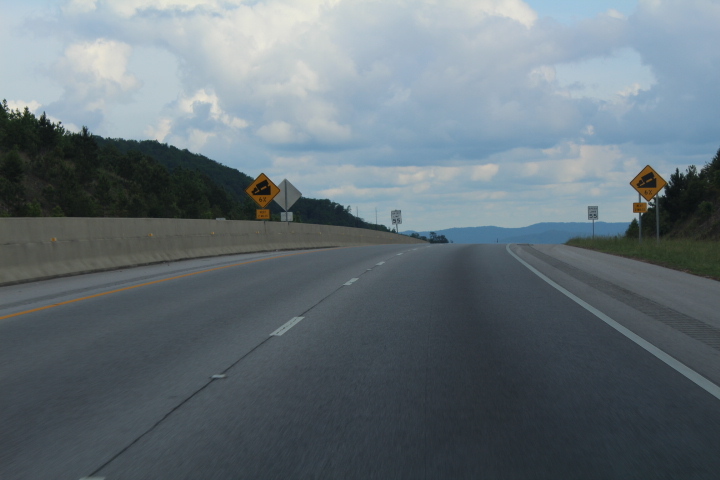 I do believe that the bypass was proposed by ALDOT to to go on the west side of Anniston but the city fathers did not want this. And last you should start reviewing all of ALDOT’s designs. Agreed. There are several schools around that intersection and dangerous highway and I wonder if they were given any thought when this road was first designed? Thanks for the comment! Oh, I have been very critical with ALDOT since this blog began and they do know who I am based on the e-mails they have sent me. As for the police, I agree there is a huge lack of them enforcing speed limits not only on this highway but on any road around town, the local police has gotten a grant to better enforce the dangerous highway, but why does it take grants to enforce? And lastly, trucks might have to be banned until something is changed, thanks for the comment! 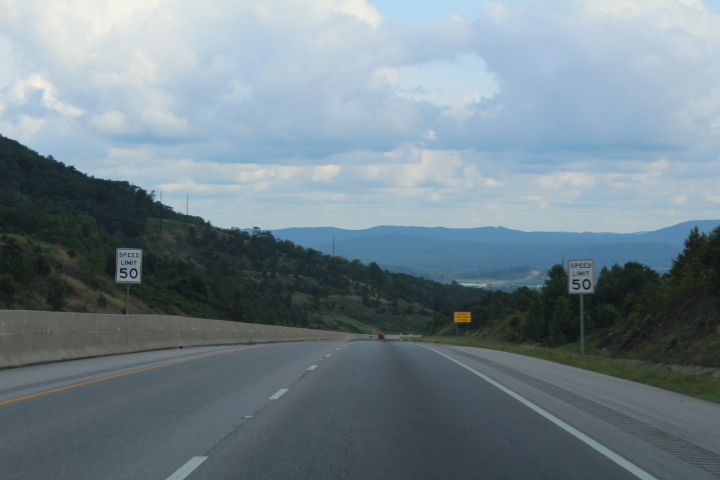 I agree, there is some room up top to build a little pulloff that requires trucks to stop and ALDOT can install a big sign highlighting what is to come going down the mountain. Thanks for commenting! Thank You! I agree with much of what you said. The easy and quick ( and maybe temporary) solution is to reduce the speed for everyone coming down the hill to 45 mph. Even slower when it is wet. The problem, as you noted is how long it takes a truck to stop, and if the speeds are too high the brakes will fail. It is the responsibility of the State to set the safe stopping speeds for the trucks for the distance. And if we don’t have enough lanes for a slow lane, then everyone needs to just go slower. It’s a school zone! There is retail there! People are dying. It’s awful. And ALDOT was consulted about the problem already and said there was none. So sad. I know, ALDOT can do all the traffic studies they want, but they really need to listen to the people that live near this dangerous area because they are the ones driving this road on a daily basis. Thanks for commenting! Don’t forget that ALDOT is working with a revenue stream (gas tax) that hasn’t increased since 1982. While it doesn’t excuse poor decisions, it has to factor into all decisions. It’s the reality that officials face. Alabamians have a long history of getting what we’re willing to pay for. Nothing new here. Yep, and with a better revenue stream this whole configuration could have been entirely different. As you say, we get what we pay for, thanks for commenting! It seems from all the comments, that speed is probably at the top in regard to the problem on the Eastern Bypass. I must admit, I was in favor of raising speed limit in order for the big rigs to get over the hills, but there i was wrong. Let’s slow the speed down for all-55 until you get to the hill going down into Golden Springs. After that, 45 for cars and 35 for the big rigs all the way to I-20. May not be the best answer but I don’t think it will hurt to try. Yeah, cops have been paroling the section since the wreck and they are pulling over people non-stop and issuing a lot of tickets every day. Thanks for commenting!